Samsung has undoubtedly had a tough year. After the Note 7 fiasco and the controversial arrest of their president, the company desperately needed something to turn things around. In comes the Galaxy S8 and frankly I’m not too impressed. Do not get me wrong; the S8 and S8+ both look like compelling smartphones. They have the DNA which made the S7 a success and they come with that beautiful eye catching curved infinity display which is sure to turn heads. But here’s my dilemma – is the Galaxy S8 enough to turn Samsung’s fortunes? I am looking to buy a new smartphone this year and 2017 so far has showed us two very impressive flagships in the form of LG’s G6 and Sony’s Xperia XZ. Sony in particular impressed me with their extraordinary 960fps slow motion camera. The S8 on the other hand doesn’t really have anything that truly stands out. Here are the questions I have been asking myself and these are the main reasons why I am hesitant to consider the S8 for my new daily driver. Do note that all the opinions below are mine and hence take into consideration what I am looking for in a smartphone. The S7 had one of the best smartphone shooters of 2016 but by the end of the year Google’s Pixel phones took the crown for best smartphone camera. Samsung recycled the same camera module for their 2017 flagship and didn’t talk about any significant improvements aside from some software enhancements. The camera may be faster and more reliable but the image quality will likely not be drastically different. On top of this, Samsung has not followed the current dual camera trend and has thus isolated themselves on the camera field. In short – the S8 does not have any compelling camera features like the iPhone 7, LG G6 or Xperia XZ. I was never a fan of the idea of an Edge display. Even on the S7 palm rejection is an issue and so is light bleed. The Edge was a gimmick albeit a good looking one. It is more prone to damage, has no real utility and don’t even get me started on putting a screen protector on a curved screen. Samsung’s main argument behind the infinity edge is that it allows more content to be displayed and that it’s more immersive. While this is true, the awkward aspect ration and thin sides make me wish for a non edge variant similar to the LG G6. Bixby is Samsung’s new digital assistant and the company looks pretty serious about it as they added a separate button on the phones to directly access Bixby. Bixby actually sounds like a pretty cool service on paper. It has context awareness, it can use the camera to look at and identify objects (even letting your purchase them or similar products on Amazon) and it can be used to control the phone with voice commands. This all “sounds” great but we actually did not see any demonstration of Bixby at Samsung’s presentation. We do not know how exactly it will work nor do we have any idea how smart it really is. Moreover, would Bixby be able to actually compete with Google Assistant? Both services offer more or less the same functionality and if I were to choose, I would pick Google and their incredible amount of user data to craft my personal assistant. Let’s just hope that this Bixby venture is nothing like the horrible S Voice and that Samsung actually makes Bixby intuitive. How’s The Battery Life Samsung? The one thing I was keeping my eye open for was the battery. Kudos to Samsung for owning up to their missteps with the Note 7 battery. I believe they were very mature and humble about the incident and have truly learned from their mistake. That’s all good. Now I want to know how long the S8 and S8+ will last. 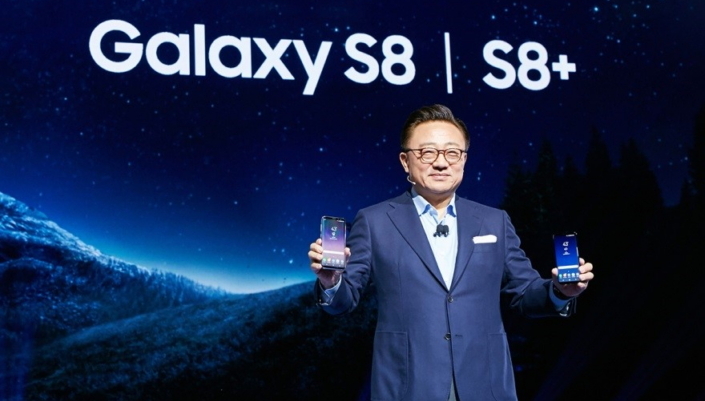 Samsung only mentioned the battery capacity and fast charging abilities of the device. Not a word was said about expected battery life. This bothers me the most because to an actual consumer the battery life is far more critical in the long run than how pretty a phone looks. Both the flagships not only have bigger displays and more pixels than the S7, they also have smaller batteries (3,000mAh and 3,500mAh). Battery drain because of the screen will undoubtedly be more on these phones which may be why Samsung set the default screen resolution to 1080p instead of the native 2960 x 1440p resolution. I use the fingerprint scanner a lot. It is one of the essential features of a smartphone. Unfortunately for us some genius at Samsung thought it would be a great idea to put the scanner next to the camera. This means that the fingerprint scanner is a good reach for even those with large hands and you will most likely smudge the camera every time. These are some of the gripes I have with the new S8 and S8+. Both the phones are arguably some of the best devices we have seen in recent memory and they will without a doubt sell much more than LG, Sony and HTC’s flagships. Samsung did a terrific job overall but I can’t help but wonder if they could have done more to make the S8 the king of 2017. I felt that after the Note 7 went down, Samsung really needed something extraordinary to win back all the upset customers like myself. At this point I am more keen to see how the second generation Google Pixel and the Note 8 turn out. For now, I will be holding onto my money. 1 Like= 1$ for the person on the deathbed becoming reality in Facebook?